For the third consecutive season, the Troy Trojans and Lyndon Tigers will meet in the Class 2-1A quarterfinals. The No. 4 Trojans will travel to Lyndon on Friday night. Troy and Lyndon have split the past two meetings with the Tigers winning 37-8 in 2013 and the Trojans winning 23-0 last season. Troy has won eight consecutive games after a 36-18 loss to Washington County to open the season. Washington County finished 10-1 and advanced to the second round in the 3A playoffs. The Trojans came back in Week 2 and built a 30-0 lead over traditional power Centralia only to need a late touchdown to withstand the Panthers furious rally for a 37-34 win. Since, Troy has cruised through their schedule with their next closest game being a 34-12 win over Onaga in Week 4. In the first round last week, Troy scored 32 points in the first quarter and led Wabaunsee 54-20 at halftime. Reid Greaser threw two touchdown passes to Chris Winkel and another to Cuttar Huss in the victory. Winkel and Huss each rushed for touchdowns and Kortin Blevins added two more rushing touchdowns. It has been a Trojan offense that has featured several different players throughout the season. Greaser has passed for more than 1,300 yards and 19 touchdowns while scoring seven more times on the ground. Huss, just a junior, is a returning Kpreps All-State selection at wide receiver in 2014. He’s been equally effective as a receiver and carrying the ball this season. Blevins, Alex Martinez, and Connor McNorton have each put up big single-game rushing totals. Along with Huss, Winkel has at least nine receiving touchdowns and Brody Winder is another good option. Troy averages 43 points per game. Lyndon played several close games to begin the season including a 26-20 loss in Week 2 to Mission Valley. The Tigers avenged that loss by eliminating the Vikings 48-32 in the first round of the playoffs last week. The Tigers have three wins by a touchdown or less this season. Junior quarterback Rylan Burns has been effective in completing 63 percent of his passes for 793 yards and seven touchdowns. Sophomore Dexton Swinehart leads Lyndon with 1,086 rushing yards and has 16 rushing touchdowns. Swinehart is also the team’s leading receiver with 37 catches for 420 yards and four scores. Nearly 38 percent of the Tiger’s offensive snaps this season have ended up in Swinehart’s hands. Senior Wyatt Fitch has added 510 rushing yards and seven touchdowns on the season. Fitch also leads the Tiger defense with 113 tackles including three tackles for loss. The Lyndon secondary will likely be tested by Greaser and the Trojans. Lyndon has 12 interceptions this season with Swinehart and junior Beau Brecheisen leading the way with four each. Phillipsburg looks to return to the sub-state championship game for the second straight season, while Meade is the lone undefeated squad in the classification. The Panthers have a pair of close home losses, 7-6 to Norton in Week 2, and 34-32 to Sedgwick in Week 6. Phillipsburg has played the No. 1 strength of schedule (SOS) in the classification, while Meade’s SOS stands at No. 36 in the 39-team classification, according to Prep Power Index. In addition to the losses, the Panthers own low-scoring wins against Oakley (20-12 in Week 4) and Smith Center (14-7 in Week 9). Phillipsburg opened the postseason with a 38-13 victory against Sacred Heart, the second straight season the Panthers have beaten the Knights in the first round. Phillipsburg has a big offensive line and talented backfield paced by freshman quarterback Trey Sides, fullback Brock Means, and running backs Conner Weinman and brothers Mark and Kirk Coomes. Phillipsburg rushed for 277 yards and Sides completed 3 of 6 passes for 51 yards in the win over Sacred Heart. Sides has great speed and runs the option game effectively. 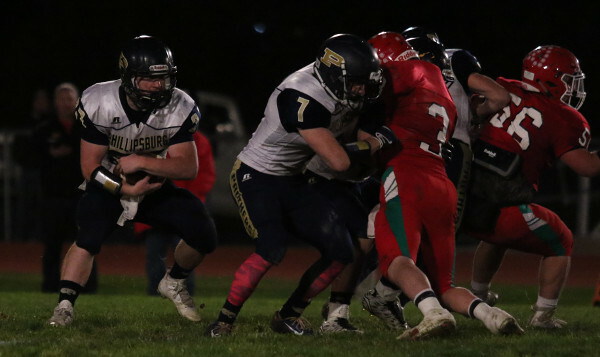 In addition, Phillipsburg’s defense has delivered quality performances against strong running games. In Week 9, the Panthers had two late touchdowns to beat rival Smith Center on the road. Kirk Coomes rushed 16 times for 117 yards and Phillipsburg held a 264-153 total yards advantage while limiting the Redmen to 115 rushing yards on 31 carries. Oakley had 32 rushes for 43 yards against the Panthers and 51 plays for 169 yards total. Norton, a 3A quarterfinalist, rushed for 140 yards against the Panthers, but needed 38 carries for 3.7 yards a rush – one of their lowest outings of the season. Meade is long known for its ground-and-pound single wing rushing attack. The Buffaloes trailed early versus Ellis last week but came back to win 42-14. Meade, led by junior quarterback Lawson Luetters, finished 10 of 16 passing for 209 yards, all season highs, and rushed 51 times for 344 yards. Meade averages 335 rushing yards a contest and has at least three rushing touchdowns in every contest. Luetters has completed 53 of 81 passes for 1,140 yards with a 19/2 TD/INT ratio. He is the leading rusher with 126 carries for 1,249 yards and 17 scores. Seniors DelRey Welsh and Kash Larrabee and junior Logan Meyers pace the defense. Meade will deliver yards but the Buffs haven’t faced a defense like Phillipsburg’s, especially against the run. The Panthers are battle-tested with more weapons in the backfield.